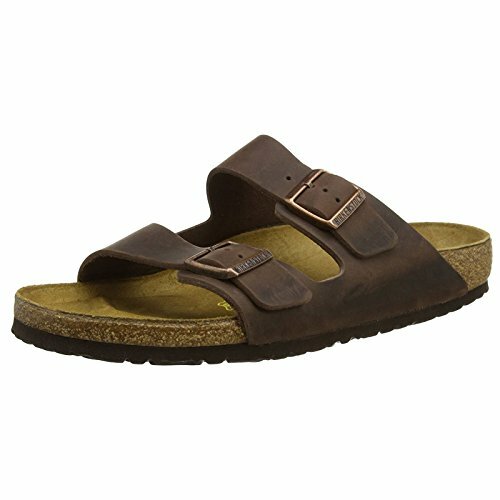 Birkenstock womens Arizona in Habana from Leather Sandals 37.0 EU W | What Should I Say? If you are looking for a fresh and on-trend summer look the classic and 100% comfortable Arizona slide sandals for women from Birkenstock are definitely the way to go. These dark brown strappy sandals are manufactured from high quality, sturdy oiled nubuck leather upper and feature two adjustable straps with buckle closure to easily get that perfect fit. These slip ons have no upper lining allowing the leather to wrap itself around the foot like a natural second skin while the anatomically correct natural cork-latex footbed encourages foot health. The suede lined contoured insole moulds to the shape of your foot creating a custom footbed to cradle and support each and every step you take. The raised toe bar is designed to encourage the natural gripping motion of your feet aiding with circulation. The neutral heel profile and deep heel cup of these open back sandals is distributing your body weight more evenly maintaining a natural posture while walking. Finishing these regular fit sandals is the flexible EVA outsole which offers lightweight, shock absorbing support with lasting durability. Made in Germany.